ion has delivered high performance compute clusters for supercomputing applications to customers throughout the Americas. Based on Intel's Xeon E5-2600 V4 processors, our current generation of HPC offerings delivers more processor cores per U and more RAM per core than ever before. ION's philosophy for HPC is focused on value, balancing server-class reliability with efficiency in cost, space & power. 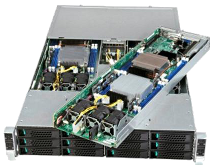 Use the ION E5 V4 Cluster Configurator below, select the number of nodes, the processors and RAM for each node and optional storage expansion, then click "Request a Quotation" to get a formal quotation that you can email to yourself. ION's High Density nodes for Intel® Xeon® Scalable Processors, PHD compute nodes, are now available. Learn more. ION Clusters are configured, mounted and shipped in APC 42U rack with power distribution, NetGear M6100 10Gb Ethernet Switch and CAT6 cabling for all nodes. Rocks Cluster Distribution Linux is installed to all nodes. frontend and compute nodes include IPMI, browser-based management and KVM over IP.